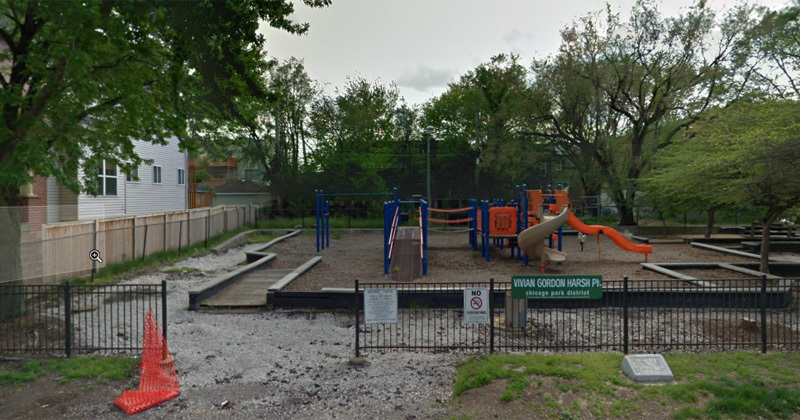 The park on S. Oakenwald Ave. where Hadiya Pendleton was killed Tuesday. Let me tie a few of this week’s stories together — all them anchored in my neighborhood, at least one literally right across the street from me. First, the utterly horrific and senseless murder of Hadiya Pendleton, the King College Prep sophomore who was shot dead at a little park on a very quiet street two blocks from my house. I’ve driven by that park literally hundreds, if not thousands of times, since I moved here more than a dozen years ago. I strolled by there with my son last fall, looking forward to when he was old enough to go down that slide. True enough, there have been few crimes on that stretch of Oakenwald, tucked just east of Lake Park. According to WBEZ&apos;s gang map, we&apos;re in a little gang-free oasis. But here’s what the news isn’t telling you: There’s plenty of crime going on around Oakenwald: drugs, burglaries, armed robberies. Empty and boarded up houses like the Muddy Waters place, which my colleague Lee Bey wrote about here last week. I’ve known that house since long before I could look out on it from my living room. As a high school kid, I was one of a handful of non-African-Americans who’d occasionally come by, especially on weekend summer afternoons when it was sweltering in Muddy’s basement studio, with the hope of catching a glimpse and song from the blues great right in his own front yard. Since I’ve been living here, I’ve seen all sorts of tourists come by, sometimes ferried by bus, and snap their pictures on the stoop. A few times I’ve witnessed clean-up efforts, and maybe a year or so ago, new signs for the doors (installed so they read “Waters” “Muddy,” one each panel, so you have have to read right to left ... ). I’ve peeked in through the windows, walked the perimeter and, in the early years, when it didn’t need a gut job, when demolishing it would have been unheard of, wondered why the city hadn’t jumped to save it. And always, it seemed, when I called or wrote to the city or any entity I was turned on to, there was something already underway. Here’s what I know now: The Muddy Waters home and the empty lot next to it, and the terrified neighbor immediately north of both, are the site of increasingly brash drug dealers. Cars come to a slow stop in front of the Muddy Waters place and greet the young men waiting there. They sit on the sidewalk, stroll up the side of the house and disappear in the back to conduct their business. Sometimes they don’t bother to more than lean in the car window. And there’s plenty of pedestrian business, enough that sometimes the young men take up residence on the stoop, or on the terrified neighbor’s stoop. The neighbors call the cops, and they come. And the young men vanish for maybe a day. And then they’re back, like clockwork. I wish I could say the Muddy Waters house is the only one. But there are more than 12 empty units on my block alone, probably more like 20. Go one block south (just one block west of where Hadiya Pendleton was killed) and the story repeats itself. Just north of us, a developer is raising two 450 unit towers, a mixed income project that had too much government aid to be denied, no matter how unnecessary to the neighborhood, which is already a wasteland of empty units. Think how tempting all those barren properties will be to the neighborhood’s more restless souls, and how dangerous to the rest of us. The problem isn’t merely gun violence, isn’t merely not enough cops, isn’t merely bad schools or lack of school choice, and isn’t merely having few supermarket and shopping options. It’s endemic, fundamental, literally from the ground up. How many more Hadiya Pendletons will it take for the city to take a good hard look at our neighborhood and others like it on the South Side? Many, I fear, way too many.